How to upload files in the portal. 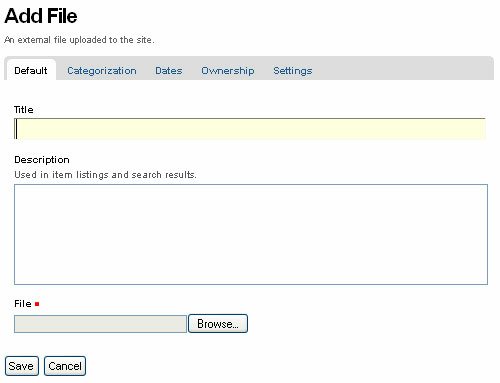 Files of various types can be uploaded to Plone web sites. Click the Browse button to navigate to the file you want to upload from your local computer. Provide a title (you can use the same file name used on your local computer if you want). Provide a description if you want. When you click the save button the file will be uploaded to the folder. Example file types include PDF files, Word documents, database files, zip files... -- well, practically anything. 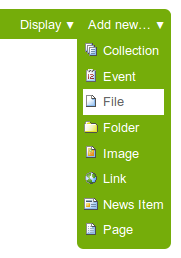 Files on a Plone web site are treated as just files and will show up in contents lists for folders, but there won't be any special display of them. They will appear by name in lists and will be available for download if clicked.